Police are searching for the suspect in a shooting in Boston's Jamaica Plain neighborhood. A man was grazed by a bullet and a woman was injured Wednesday afternoon in a shooting outside a convenience store in Boston's Jamaica Plain neighborhood. Boston police said they received a report of a person shot at Pimentel Market at 340 Centre St. just before 3 p.m. The shooter's bullet grazed a male victim outside the market. The victim ran inside the store. His injuries are not believed to be life threatening. 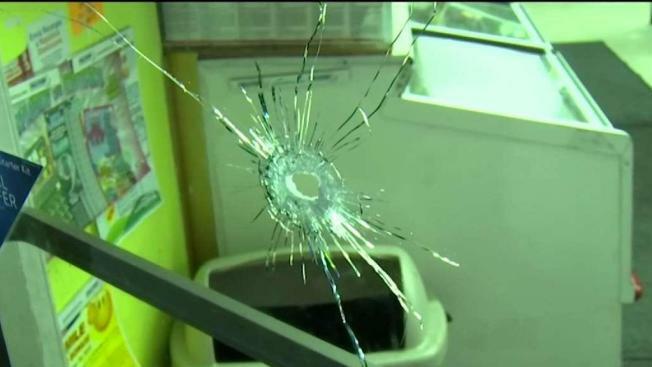 A woman who was inside the store at the time of the shooting was hit by broken glass. She is also expected to be OK.
"Our neighbor was actually walking her dog when it happened, so she saw him walk up, just shoot into the store and run away," said Lauren Sullivan, who lives nearby. Pimentel Market's owner says the shooter was waiting for the male victim, his intended target, outside the store. "He saw the guy about to shoot him, so he turned back into the store, and I guess the guy shot at him," Alvin Guerrero said. Multiple bullet holes could be seen in the store's glass door. Guerrero credits bulletproof glass with protecting the people in the store. "I guess she was real close to the glass and it ricochets off the glass and cuts her," Pimentel said of the female victim. "It's awful. It's awful for the poor woman who's in there, just comes to do some shopping," police Capt. John Greland said. "This is a gunfight, basically, you know, a guy cuts loose with rounds." "It's horrible. I haven't seen anything like this up here in a long time." Police are still searching for the suspect, who is believed to have fled on foot. A description is expected to be forthcoming. This is the second shooting in the past week at a Jamaica Plain business after a man was shot and killed at Professional Barber Shop on South Street last Saturday.